What Are DBS Checks I hear you ask? Well A DBS check is a police report which details any and all offences the police have on their system against a specific person. A DBS Check lists any criminal offences listed on the police system against a specific person. What Types Of DBS Checks Are Available? There are two types of DBS checks in England & Wales, first is the Standard DBS Check which details convictions, cautions, reprimands and warnings held in England and Wales. 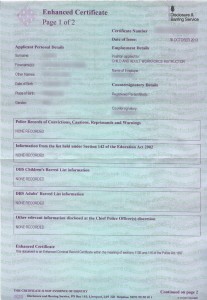 The second is an Enhanced DBS Check, this check contains the same data as a standard DBS check (convictions, cautions, reprimands, warnings), however it includes children’s and vulnerable adults barred lists check and local police force information. What Happens If I Fail A DBS Check? In short it is impossible to fail a DBS check, a DBS check lists your relevant convictions and for that reason you can’t fail a check. However that said there are certain job roles where certain convictions would prevent you from working in that job role. 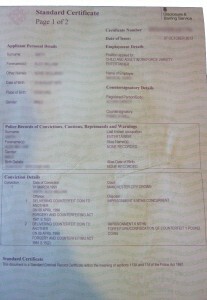 Below are two example certificates, the first showing an enhanced certificate with no relevant information, the second showing a standard certificate which has relevant convictions.